With Christmas fast approaching, living room floors across the country will soon be filled with torn packaging, crumpled up wrapping paper and shiny new gifts (some appreciated, some not). If your household gift giving and receiving this Christmas involves a rather expensive array of the latest ‘high-tech’ gadgets, you’re probably about to become the proud owner of more than one unused device. Our research shows that 1 in 5 Australians will admit to hoarding e-waste, and the average household has 15 unwanted electronic devices. Not only do these devices clutter up your drawers, holding onto them prevents valuable materials getting a chance at a new life. New gifts superseding old technology can cause a real headache for the sustainable-minded. We’ve put some thought to this and have come up with the ultimate e-waste warrior’s survival guide. 1. Out with the old, in with the new – it’s off to a recycling centre for you! What’s on your Christmas wishlist? Are you replacing a laptop or television? If so, put a note in your diary to recycle the older device. See if any other family members are doing the same – once you’re done explaining to grandma how to unlock her iPad and what an ‘app’ is, ask if she (or anyone else) has any old tech gathering dust that can be brought in for recycling and take them all at once. 2. Declutter: While a lot of e-waste ends up in landfill, a lot more gets stashed in cupboards, garages, spare rooms and shelves. A yearly clean out will usually involve a trip to the op shop with a bagful of clothes or a bootful of furniture, but the drawerful of old devices and cords often gets reburied to be dealt with at a later date. Make this the year your e-waste sees the light of day! 3. No need to untangle the mess! Confronted by those random power cables from your old TV, computer, printer or laptop that have meshed into one untangleable ball? They can be recycled by TechCollect, even if they’re all knotted up in a drawer and you don’t know which cable belongs to which device. 4. 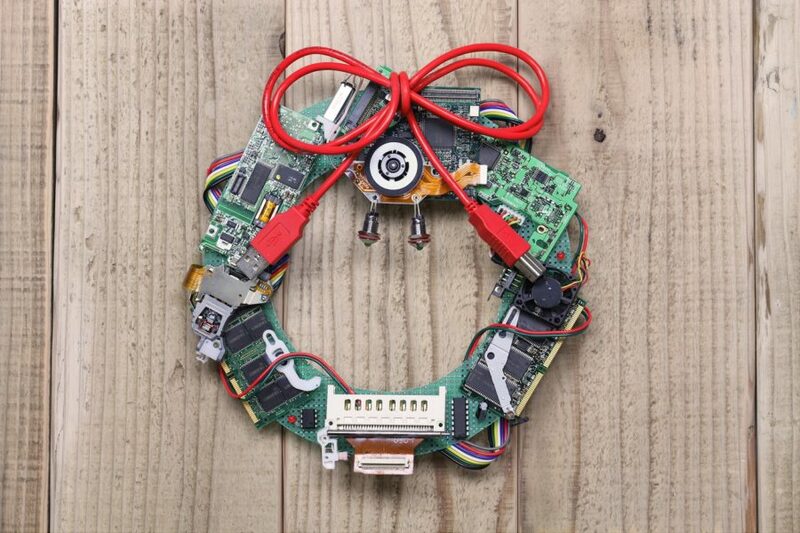 Spread the Christmas cheer:What is your place of work doing with their old computers and IT equipment? Encourage colleagues to send a company-wide email with a call out for old technology devices, so they can do a group drop-off to a local collection site. 5. What goes where: Under the National Television and Computer Recycling Scheme (NTCRS), we can recycle computers, laptops, computer peripherals, printers, TVs and cords – see a full list of what we accept here: https://techcollect.com.au/what-we-take/ and take any of these items to your nearest TechCollect site. Anything you dig out of your closet that’s not an item we accept, check out Planet Ark’s recyclingnearyou.com.au – phones, mattresses, paints, printer cartridges – it’s amazing what you’ll find on that list! 6. Hand-me-down: Do you have a computer or TV that is still in good working condition that you’re not quite ready to let go of yet? Give it to a family member or friend and make it an early Christmas present. 7. Delete your data: Our research shows that 64% of Australians are hesitant to recycle their e-waste because they are concerned their data will get into the wrong hands. Visit our comprehensive data deletion instructions and ensure your data is wiped (and any wanted data saved elsewhere) before dropping off for recycling. 8. Find your nearest site: We now have over 250 collection sites, including in some of the most remote areas in the country – so there’s bound to be one close to you! Many are in convenient locations such as retail stores, so save time and take your e-waste along with your green bags next time you go.